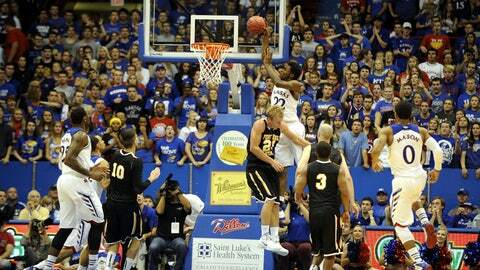 Kansas freshman Andrew Wiggins tipped off his much-anticipated collegiate debut with a 16-point effort against Louisiana-Monroe. College basketball’s opening weekend has become known less for upsets and classic games than the sheer pomp and circumstance surrounding the official drop-the-curtain moments for teams around the country, both top programs with star-studded recruiting classes and mid-majors returning landscape-altering veterans, along with everything in between and thereafter. With the mild exceptions of top-50 showdowns in South Korea (Oregon-Georgetown) and New York (UConn-Maryland) and a few surprising results, the the sport’s 2013-14 unveiling matched the expectations.The oft-publicized youngsters looked college-ready, top-25 teams emerged unscathed and Doug McDermott still remembers how to put the ball in the basket. But in the words of Kentucky’s standout freshman Julius Randle following his team’s dismantling of UNC-Asheville, "We still have a long ways to go." 1 If there’s a way to simultaneously hop on multiple bandwagons heading into college basketball’s first full week of action, then that’s where I (along with many others, surely) stand. There’s plenty to like on plenty of teams. The nation’s preseason top five teams — Kentucky, Michigan State, Louisville, Duke, Kansas, respectively — opened the season in impressive fashion, winning by an average of 31.4 points in their openers. No surprises there. Many of those games were considered tune-up outings or extensions of the exhibition season anyways. Such is the general power structure in college basketball’s scheduling: the smaller schools get some exposure, the larger schools get a de facto homecoming-type atmosphere and onward they march. Still, with so many moving parts and new pieces in place for the championship favorites, there was more intrigue than usual (and very little to scrutinize) at the top. Moving down the polls, Oklahoma State, Ohio State, VCU, Gonzaga and New Mexico won in similarly dominant fashion while Florida, Arizona, Michigan, Syracuse and UCLA got off to slow starts for various reasons (injury, chemistry, violations of team rules, foul trouble). Some teams simply take longer to gel than others. There seems to be a disconnect between those top-five teams from the rest of the group, though. Perhaps its theanticipation surrounding the Champions Classic doubleheaderin which four of the five will participate onTuesday night. The leftover? The defending national champion Louisville Cardinals. Perhaps it’s the superstar recruiting classes and overall talent level. Perhaps the polls have it all wrong. Either way, we’ll know a lot more after watching events unfold in Chicago. 2 Following his 2006 debut against an overmatched Alcorn State, an 18-year-old Kevin Durant addressed first-year expectations and the concept of immediate dominance at the Division I level: "It’s going to be crazy … I guess the fans can just sit back and watch." Fans, media, opposing coaches. All the same. Durant scored 20 points that November night, one of 30 such outbursts on his way to becoming the first freshman to ever win the Naismith Award. As we approach the official 10-year anniversary of the one-and-done era, this type of instantaneous production has become commonplace. On Friday night, four different teams unveiled the consensus top five players in the acclaimed 2013 class. In watching four of the five in action (sorry, Arizona), those individual rankings were justifiable, to say the least. 3 Mike Krzyzewski has done some lineup tinkering over the past few years when given the opportunity. 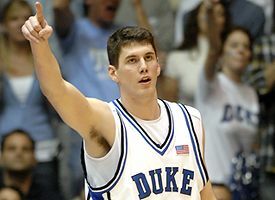 Though often saddled with a more traditional college center in Durham — think of Mason Plumlee, Shelden Williams or that guy who actually started on a title-winning team — Coach K utilized his position as Team USA head coach to try out the en vogue "small lineups" against international competition throughout the Olympic competition. Krzyzewski ran out the likes of LeBron James, Carmelo Anthony, Russell Westbrook, Chris Paul and Deron Williams … to mixed results on the offensive and defensive ends. Well, the all-time wins leader again has some versatility at his disposal, and judging by his comments throughout the offseason and following a throttling of Davidson, he plans to use it. And if the result against the Wildcats is indicative of just how explosive this Blue Devils team can be — it’s worth noting that Davidson is coming off back-to-back NCAA appearances and returned a very, very good player in forward De’Mon Brooks — then even a stacked ACC is in for some trouble. Built upon the flexible foundation of Parker (6-foot-8) and Mississippi State transfer Rodney Hood (6-foot-8), who built up quite a reputation after practicing with the Blue Devils all last season, "Going Small" is back in the works. Parker and Hood have both been given the green light to bring the ball up the court on defensive boards and both possess the ability to go inside-outside, defend four positions, hit outside shots and rebound. "A lot of the really special players don’t have a position," Coach K has said. Though there is still the luxury of turning to starting big Amile Jefferson or backups Alex Murphy, Marshall Plumlee and Josh Hairston, Friday’s results were fairly revealing. Parker and Hood played more minutes than any of the non-guards despite Parker dealing with some second-half foul trouble. No problem: the frosh poured in 22 points in 23 minutes while Hood scored 22 and added nine boards. What it is to say is that Duke not only has an opportunity to be efficient, but both fast and efficient with the on-court presence of Parker and Hood, not to mention uptempo-capable guards Quinn Cook and Rasheed Sulaimon. So will it be enough to get to Jerry World? As Krzyzewski’s national team learned at times, small ball can limit effectiveness on the defensive end and Krzyzewski’s only national title of the past decade came with his team playing at an top-tier level on both ends of the floor. Still, Duke was one of my preseason Final Four picks (along with Kentucky, Louisville and Ohio State) for a reason and Friday’s first glimpse allowed little room for doubt. 4 Though the Big East is completely renovating its lineup following the departures of Syracuse, Louisville, UConn, Notre Dame, Cincinnati, Pittsburgh and Rutgers, the opening weekend was a reminder that the cupboard is not entirely bare. The additions of former mid-major powerhouses Creighton, Xavier and Butler will certainly add some basketball character back to the conference. But the bigger conferences did not pillage everything. No. 17 Marquette looks like it will be the same grind-it-out program, Villanova should be a factor and, even in a losing effort, Georgetown managed to impress. The Hoyas received 25 points and four rebounds out of UCLA transfer Josh Smith, who was an absolute load on the interior and frequently found open cutters against a very good Oregon team.Just the fact that Smith, who has battled weight and stamina issues (he averaged just 13.5 minutes per game last season in Los Angeles), stayed on the court for 27 minutes was a pleasant surprise for John Thompson III’s team. Lumped in with standout senior guard Markel Starks (16 points, four assists vs. Oregon) and a host of returnees, the Hoyas should be able to downplay the absence of departed star Otto Porter and make a run at another league title. However, there’s another team (and another player) warranting some attention. The Providence Friars have not won more than 10 games in conference play since the 2008-09 season and they have not reached the NCAA Tournament since current Oklahoma City Thunder forward Ryan Gomes’ led them there in 2004. As for postseason success, Providence has only won a select few NIT games since the Austin Croshere-led ’97 team made it to the NCAA’s Elite Eight, knocking off Marquette and 2-seed Duke in the process. This might be the year to turn that all around, though. The Friars return one the league’s best inside-outside tandems in Bryce Cotton and Kadeem Bates from last season’s 19-win team, and it paid off immediately in an overtime win over Boston College — Cotton logged 28 points, six rebounds and four assists in what could become his national breakout performance. As one of the nation’s leading scorers last season (19.7 points per game, 22nd nationally), the 6-foot-1 Cotton developed into a go-to offensive force: hitting the 20-point mark 19 times while limiting his turnovers and forcing opponents to put him on the free throw line. Though the two are not mirror images of another — the 6-foot-5 Brooks certainly projected better to the pro level and was a much better rebounder — Cotton’s outburst against the Eagles did little to knock those "making the leap" comparisons off track. In his senior season, Brooks was used on nearly 30 percent of the Friars’ possessions, scored 24.6 points per contest and became a excellent rebounding guard (seven per game). Even with an indefinite suspension looming for the program’s two 2013 recruits — Brandon Austin and Rodney Bullock — the return of starters Bates, LaDontae Henton and Josh Fortune mean that if Cotton can make similar improvements across the board, the Friars will not go quietly into the Big East night and should challenge for their first tourney appearance in a decade. Sure, there are preseason favorites to win the Naismith Award. However, it’s a bit too early to start naming definitive names. So we’ll run with some of the remaining top performances from the opening weekend, keeping in mind this will transform into the National Player of the Year watch by December. Shabazz Napier, UConn: The senior point guard wrapped up the 2013 season in the top-50 of Pomeroy’s offensive rating metric — though he was just the second-best Shabazz on the list — and he’s already off and running this season. Against a quality Maryland team, Napier led the Huskies in points (18), rebounds (7) and assists (7) in one-point win. With so few teams opening against an NCAA Tournament-quality opponent, Napier makes the cut. Cady Lalanne, UMass: Poor Boston College. The Eagles are expected to be much improved this season after bringing back practically everyone from last year’s team, but they ran into two outstanding individual performances in the first three days of the season. First came Cotton. Then, on Sunday afternoon in the Coaches vs. Cancer Classic, Lalanne, a 6-foot-10 junior center, put up 27 points and 12 rebounds to get the Minutemen in the win column. This win should look good on the resume come March for the Atlantic-10 squad. Trevor Cooney, Syracuse: Hitting three 3-pointers in a four-minute span to build a lead against Cornell, it appears Jim Boeheim has a shooter on the roster to help replace sharpshooter James Southerland. Cooney, a four-star recruit in the 2011 class, put up a career-high 27 points (7-of-8 3-pointers) and four steals, and the Orange needed it. His presence should help space the floor for the likes of Rakeem Christmas and preseason ACC Player of the Year selection C.J. Fair. Casey Prather, Florida: All the Gators were missing against North Florida were starting point guard Scottie Wilbekin, guard Michael Frazier II, big men Dorian Finney-Smith and Damontre Harris and highly-regard freshman Chris Walker. Luckily they had Prather in a too-close-for-comfort eight-point victory. The 6-foot-6 forward scored 28 points and grabbed eight rebounds, doing the majority of his damage within the 3-point arc and on the free throw line. Boise State: Expect to see the name Anthony Drmic in this space quite a bit over the course of the season. All the 6-foot-6 Australian guard did in his opening act was score 34 points — the highest individual performance nationwide on Friday — on 12-of-22 shooting. Paired with fellow high-scoring guard Derrick Marks and a bevy of quality role players, I expect Drmic to lead the Broncos to the NCAA Tournament (8-seed or better) and the school’s first tourney win in my lifetime. The Broncos’ November schedule should present plenty of opportunity for such gaudy numbers to keep rolling in, but an early-December stretch of Utah, Kentucky and Saint Mary’s will provide a good gauge on just where they place in the national pecking order. Gonzaga: Last month, while in town for the Western Athletic Conference’s basketball media day, Gonzaga coach Mark Few dropped by the Los Angeles Lakers practice facility to visit two of his former players: Robert Sacre and rookie Elias Harris, the latter of whom helped lead the Bulldogs to the school’s first-ever No. 1 seed in the NCAA Tournament. Three thousand miles to the east, Few could have found another former player, Kelly Olynyk, a 2013 Player of the Year candidate now playing for the Boston Celtics. Drexel: The Dragons nearly spoiled Steve Alford’s inaugural game on UCLA’s sidelines, falling 72-67 in Pauley Pavilion. It was a one- or two-possession game of the final four minutes. Returning two All-Colonial-caliber guards (Damion Lee and Frantz Massenat, who combined for 37 points on Friday night), Drexel looks like it could bounce back from last season’s disappointing 13-18 record. » The Champions Classic is one of the best early-season aspects of the college basketball schedule, and this year’s event in Chicago might be the best it’s ever going to get. With the AP Poll’s Nos. 1, 2, 4 and 5 teams in attendance, the talent level, the storylines (Jabari Parker heading home; Wiggins v. Parker; Experience v. Youth in Kentucky-Michigan State) and the national Tuesday night spotlight, it’s going to be the closest we get to March Madness until, well, March. Last week, it was announced that the Champions Classic was extended through the 2016 season as the game travels to Indianapolis back to Chicago and then New York. At the very least, this guarantees two top-25 matchups for the foreseeable future. That’s a big, big win for all involved. And as Kentucky coach John Calipari said in a statement: "When you talk about Duke, Kansas, Michigan State and Kentucky, you’re talking about four of the best programs in our sport." » Back to Arizona. No more ignoring the sixth-ranked Wildcats come Thursday night as they travel to Viejas Arena to face off against Steve Fisher’s San Diego State team. The Aztecs, though losing star junior Jamaal Franklin to the NBA, are never an easy out, ranking top-25 nationally in defensive efficiency in five of the past eight seasons. Can the Aztecs pull it off? I don’t see it happening as they transition the offense to guards Xavier Thames and sophomore Winston Shepard along with transfer Josh Davis (17.6 points per game at Tulane last season), but it will be a test for a young and talented Arizona roster that features eight former four- or five-star recruits including Gordon, the crown jewel of coach Sean Miller’s 2013 class. » The Oakland Golden Grizzlies weren’t shy with their scheduling. The uptempo Horizon League newcomer are taking on perhaps the nation’s most brutal first week of the season by facing No. 12 North Carolina, No. 22 UCLA, Cal and No. 15 Gonzaga. Oh yeah, then there’s a road trip to Michigan State next month. The Tar Heels walloped them in Chapel Hill on opening night, 84-61, but if the Grizzlies could steal a win out of this four-game stretch it will be a nice boost for coach Greg Kampe’s program. » Ohio State and Marquette, two Elite Eight participants last season, highlight the weekend slate and there are plenty of questions for both programs: Who will become the Buckeyes’ go-to scorer to replace Deshaun Thomas (there are plenty of options); How will the Eagles handle the early departure of Vander Blue? ; Just how good can both teams be on the defensive end? ; Will Aaron Craft ever make The Leap offensively? "It’s going to be crazy … I guess the fans can just sit back and watch."